The last time I went on a solo adventure was in 2010, when I attended Harvard Summer School. Let’s just say, I didn’t return solo: I met the man of my dreams and ended up marrying him six years later. And let me start by saying that no, it doesn’t mean you have marital problems or you’ve reached the seven year itch when you decide to go on a last minute solo adventure. I think it’s absolutely healthy – and essential – to be an individual as well as being part of a team in a marriage or relationship. And I really love our team. Our team rules. But since I’ve been a little (a lot) lost lately, even more so than usual, I felt like it would be good for me to spend a few days on my own and completely rely on myself. 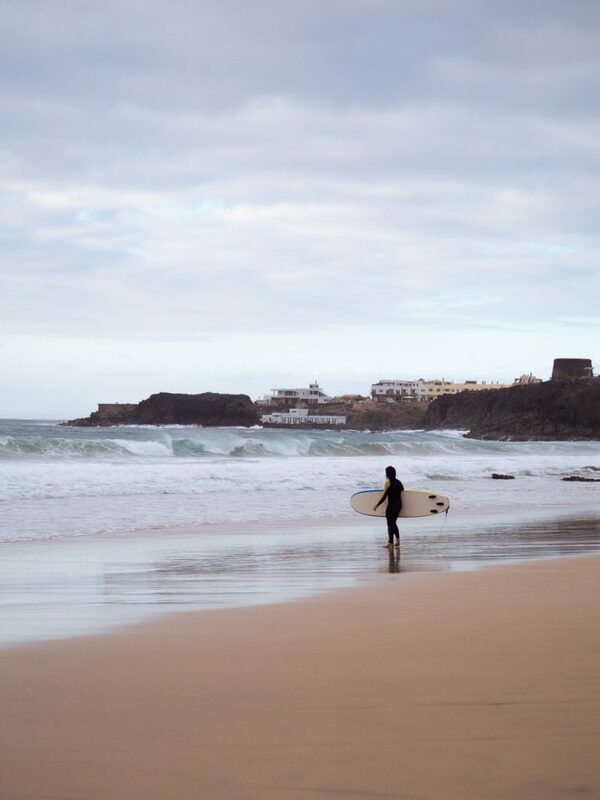 So I booked a last minute solo surf & yoga trip to the island of Fuerteventura. First things first: where the hell is Fuerteventura? 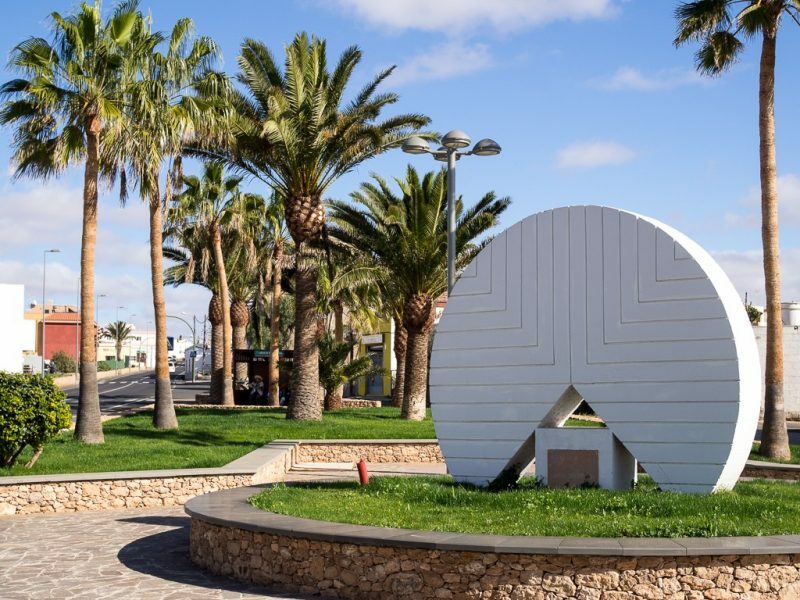 Together with seven other islands (and 6 very small ones) known as the Canary Islands, Fuerteventura is officially a part of Spain. But geographically these islands are closer to Africa than Europe. From Fuerteventura it’s only 130km to the coast of East Africa. Hence: the weather is pretty much perfect year round. Even in late January it was 23 degrees and very sunny. 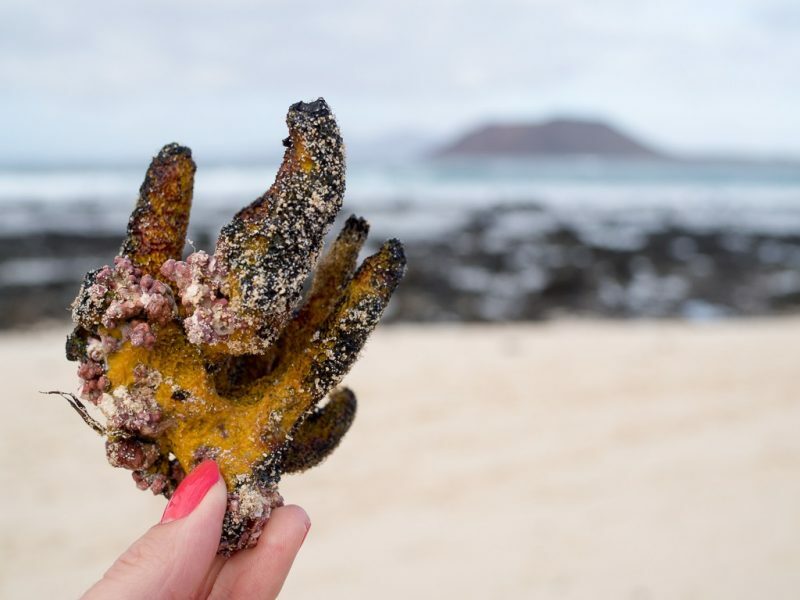 The islands were formed due to volcanic activity in the region, and this is especially visible on Fuerteventura and Lanzarote, the two oldest ones. 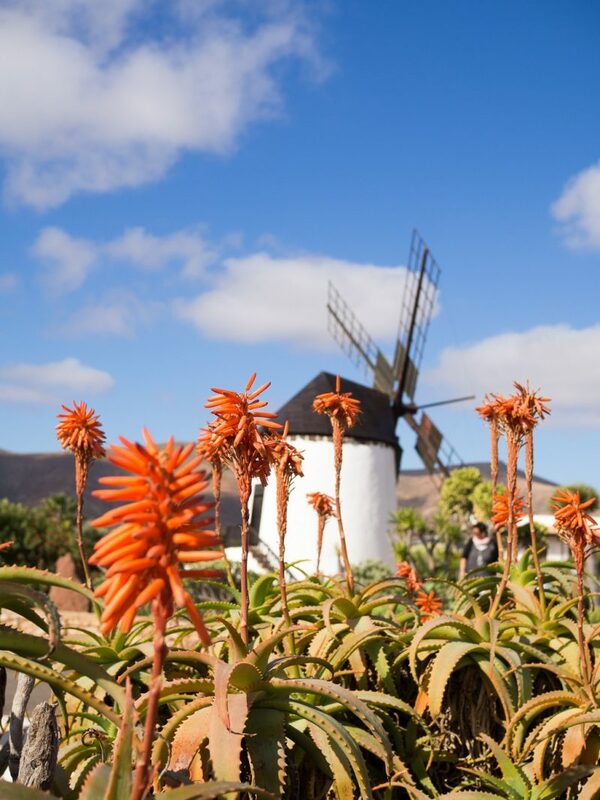 So if it’s lush green tropical vibes you’re looking for, you should probably go to Tenerife – like most sunbathing tourists do. 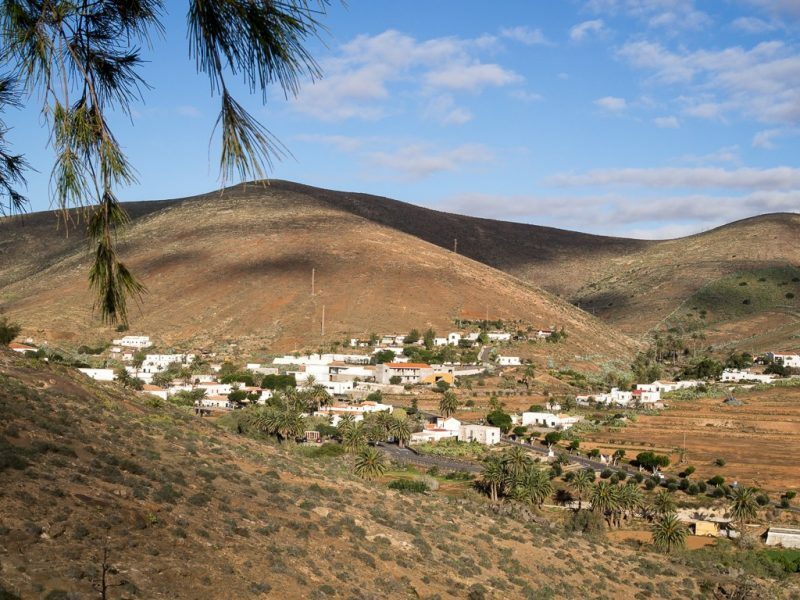 But if you’re like me, and you prefer rough and wild nature, with a more laid-back and not so touristy vibe, I can highly recommend Fuerteventura. 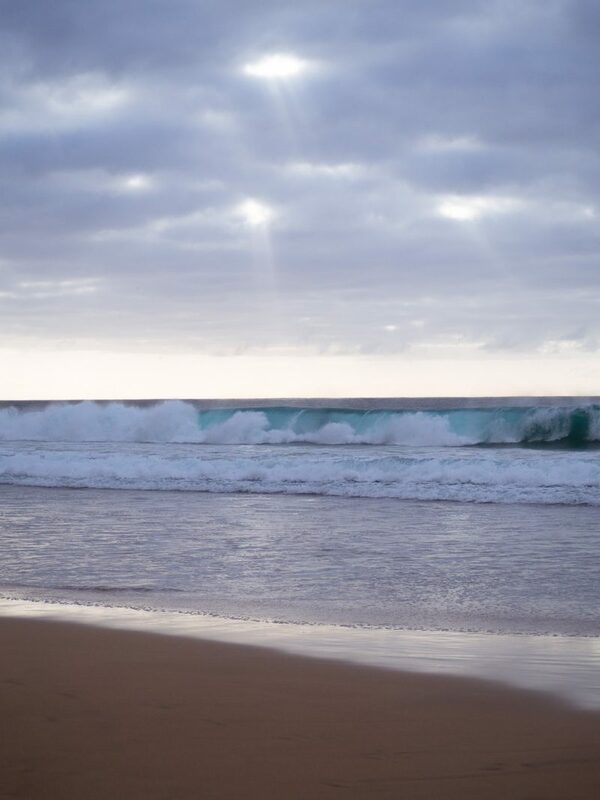 So my main reason to go to Fuerteventura was for the perfect surf conditions, pretty much year round. 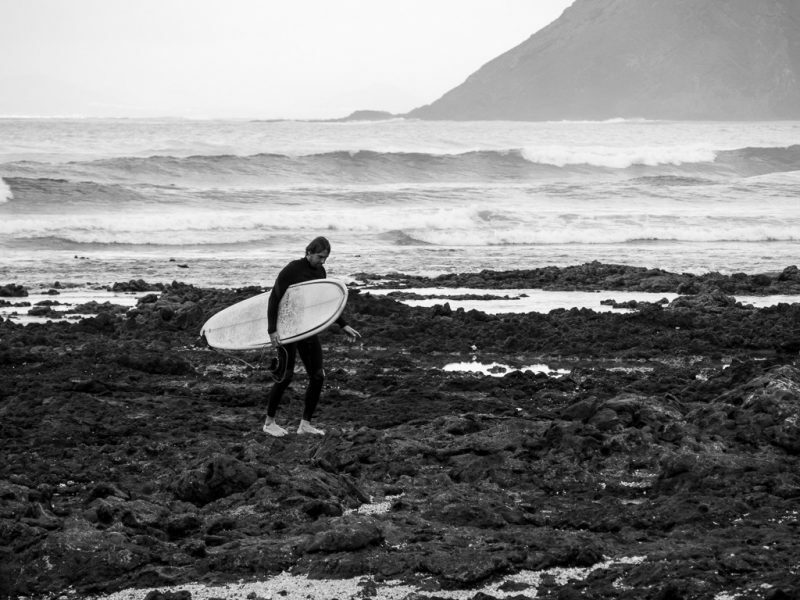 The island is considered the best place in Europe for surfing. 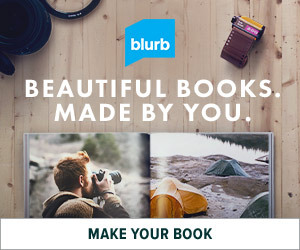 Well, I guess Portugal and maybe even France would disagree. 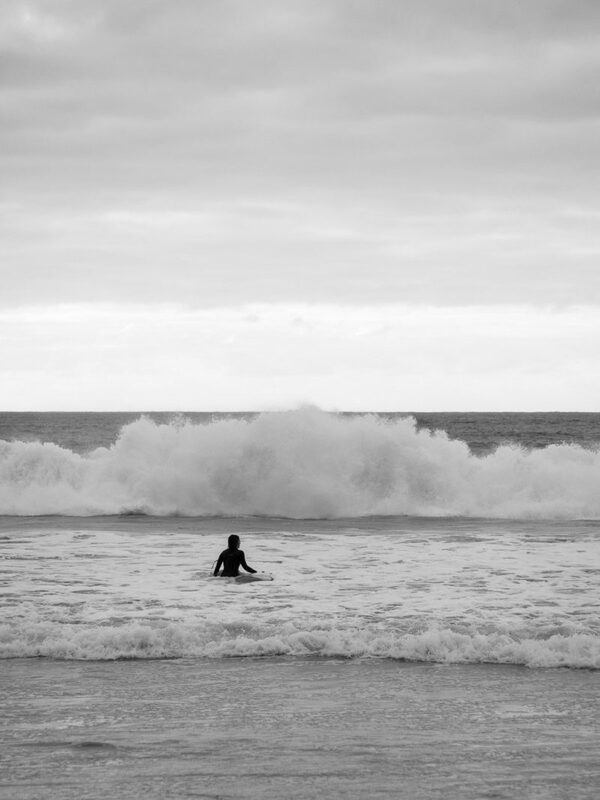 The best thing about surfing on Fuerteventura is that there are SO MANY different surf spots, so there’s a good wave to be found every day, no matter what the conditions are. So if the wind changes direction you just drive to one of the other 150 beaches on the island. What’s that, Portugal or France? Oh right, you can’t do that on your coasts. 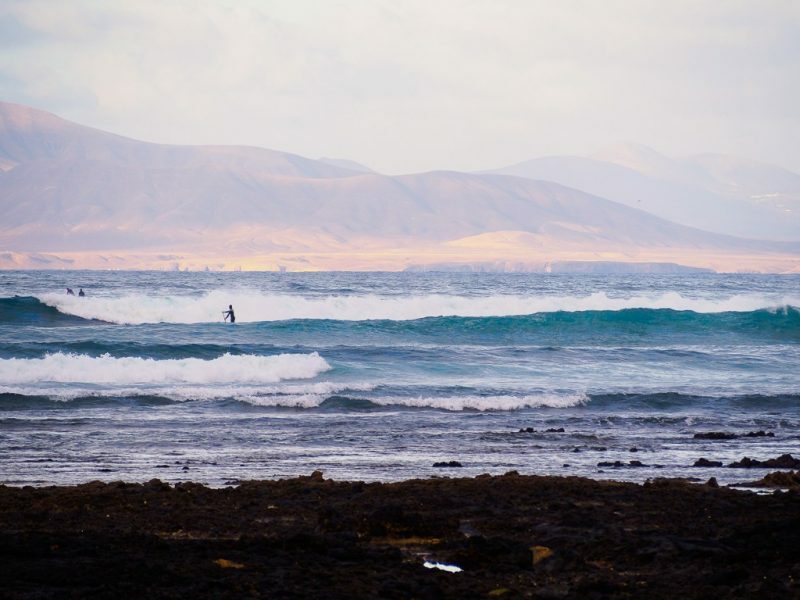 Fuerteventura is basically Europe’s answer to Hawaii when it comes to surfing. I booked a few days of surf lessons with Line Up Pro Center, and I cannot recommend them enough. I got lucky and had two days of private surf sessions, and the other two days I had to share the instructor with only two other girls. Both my surf instructors were amazing, super knowledgeable and also very fun to hang out with. And yes, that’s important when you’re spending hours and hours in the water together. My surf skills improved rapidly thanks to their coaching and by the end of the week I was catching waves by myself on a 7″ board (this humongous big board below was just a photo op!). YEAH. Each morning the guys from Line Up would check where the conditions were best for us beginners. And then we drove to that particular beach, so I have surfed at a few different spots on the island. 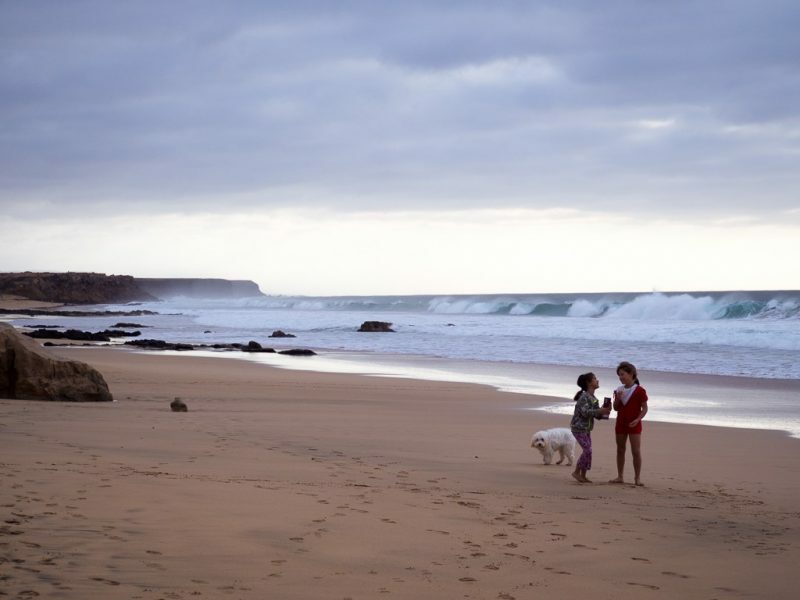 My first day was at El Cotillo Beach, a famous surf spot on the west coast of Fuerteventura. It’s an intense beach break and there was a super strong current. And even though I managed to stand up on my first day, I had a lot of classic beginner wipe outs. I pretty much swallowed an ocean. El Cotillo is also a fantastic place to watch the sunset. Unfortunately, it was a bit cloudy when I came back here for the sunset. 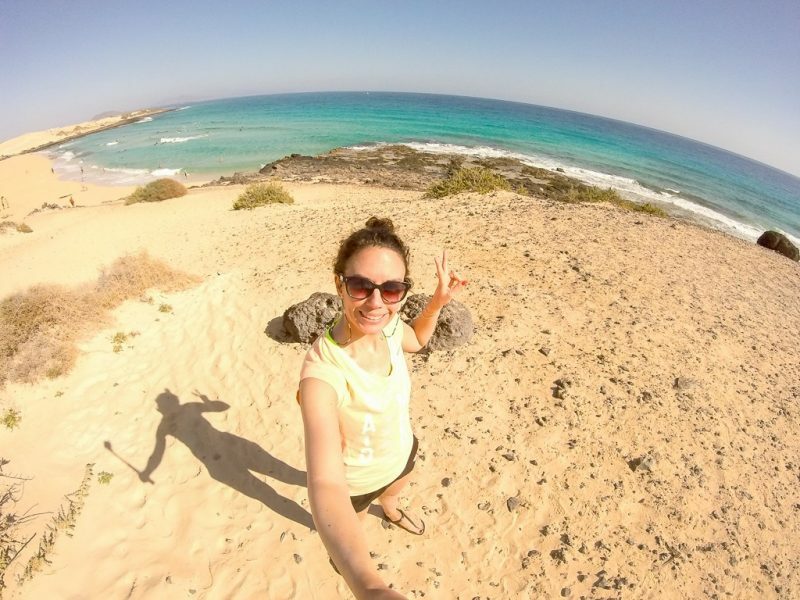 To get to El Cotillo you have to go a little bit off road, so don’t forget to get full coverage on your rental car :). 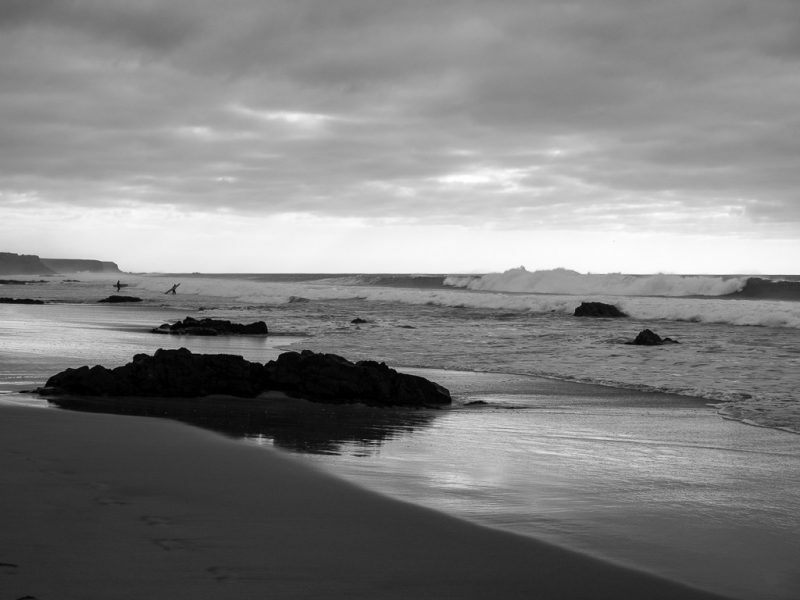 I guess the most popular surf spot on Fuerteventura is Punta Elena aka Rocky Point. It’s a point break and it works both with low tide (outside) as with high tide (inside), so there’s basically always someone surfing. It’s also good for stand up paddling. 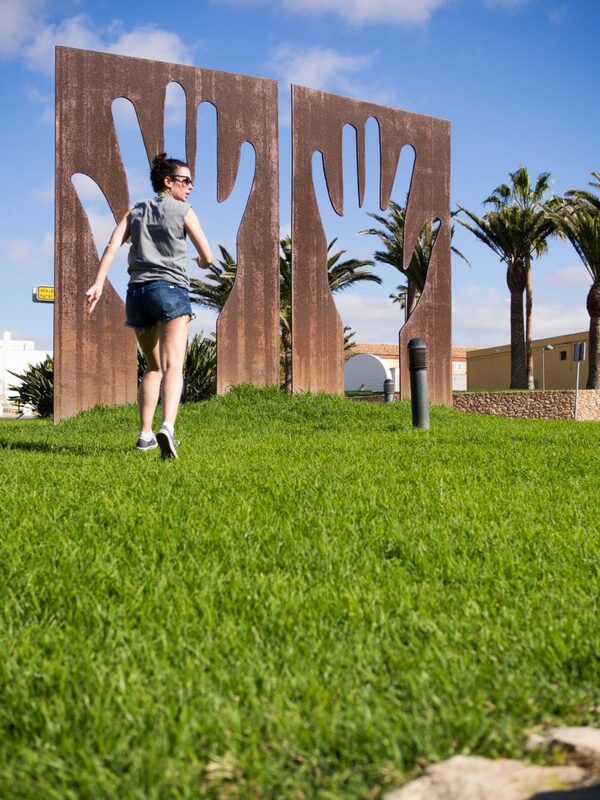 It’s located pretty much in Corralejo town, so if you don’t have transport this is a convenient surf spot. Beware that the name Rocky Point is very accurate, and there are rocks EVERYWHERE, so you’ll end up with bruises all over your body. 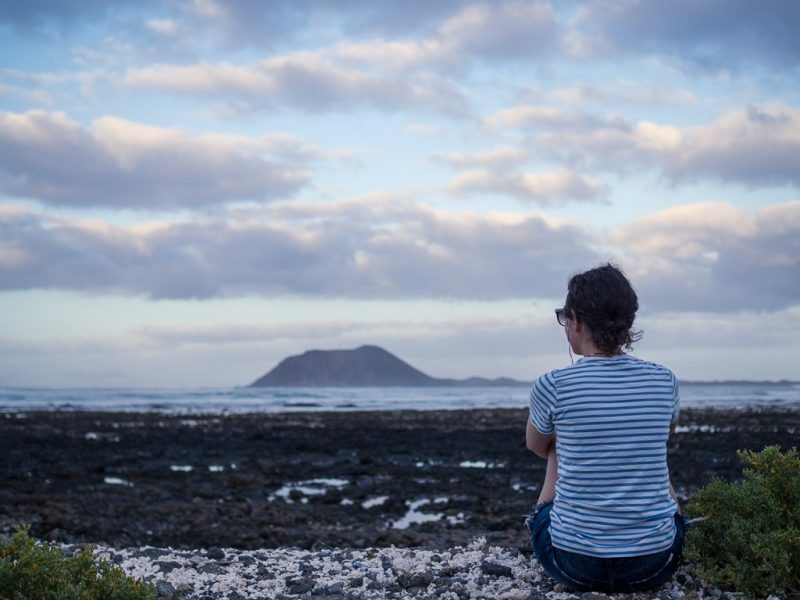 You can see Isla de Lobos from Rocky Point, the small uninhabited island off the coast of Fuerteventura. 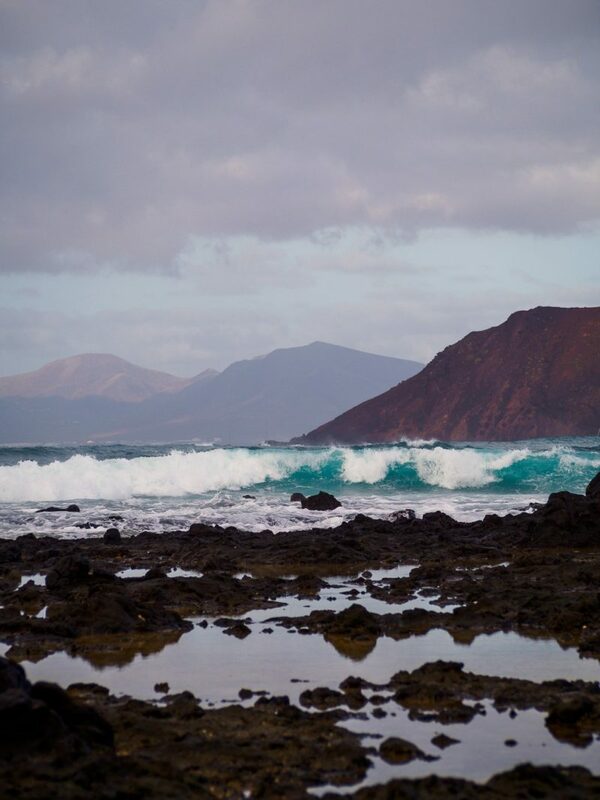 Between Fuerteventura and Lobos you’ll find the longest wave in Europe, it’s spectacular. You have to get on a boat to actual get to this wave. Very cool. Obviously for pro’s only. This beach break is not only a very good spot for beginners, it’s also a very nice beach to chill in the sun and watch some surf. 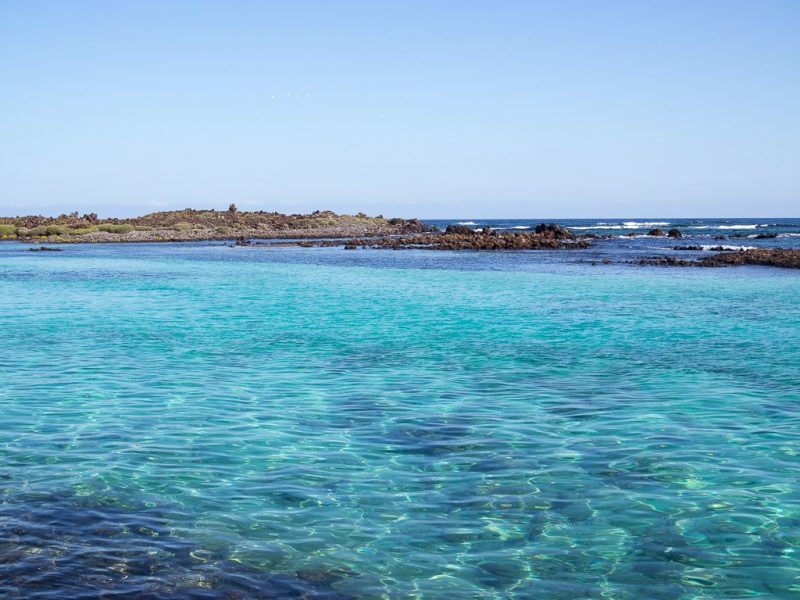 It’s located in Corralejo Sand Dunes Natural Park, on the east coast, meaning it has a beautiful soft sandy beach, and almost turquoise water. This was my favorite spot because there are very nice clean waves and I even managed to catch some green waves here. Which basically means I’ve graduated from beginners’ white waves, and I’m now ready for a real line up. Sort of. 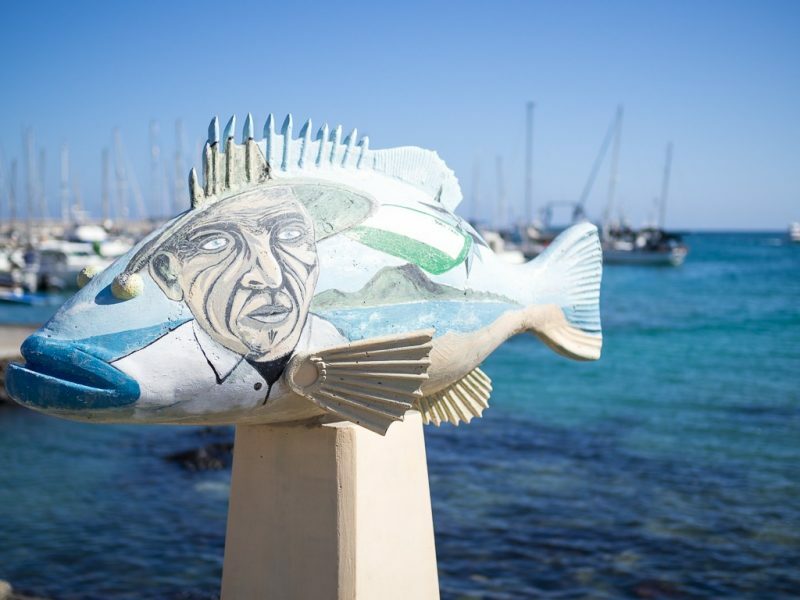 The best decision I made was to base myself in Corralejo, a small town in the north of Fuerteventura. 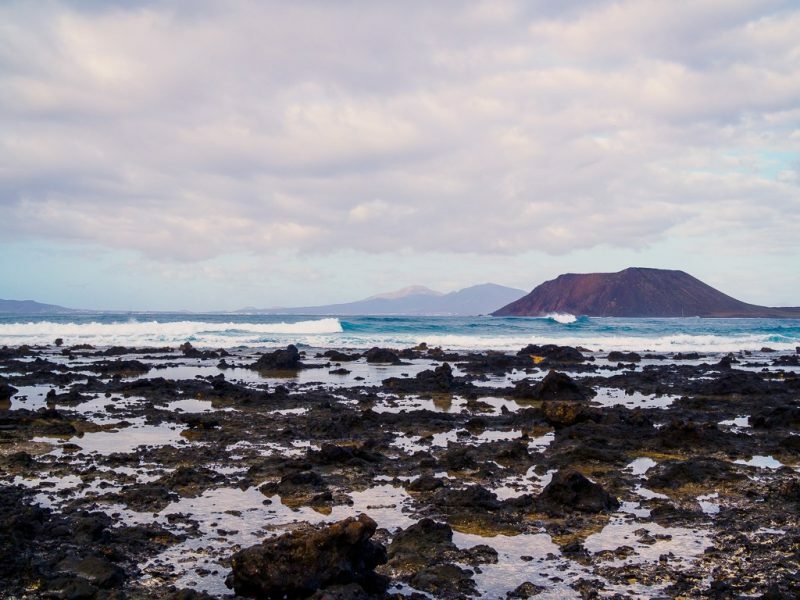 Although there are also some surf schools in the south, you should definitely stay in Corralejo as this is closer to the best spots, which is the reason that many local surfers live here. I stayed at Line Up Surf Camp, which is a very nice and modern surf house. 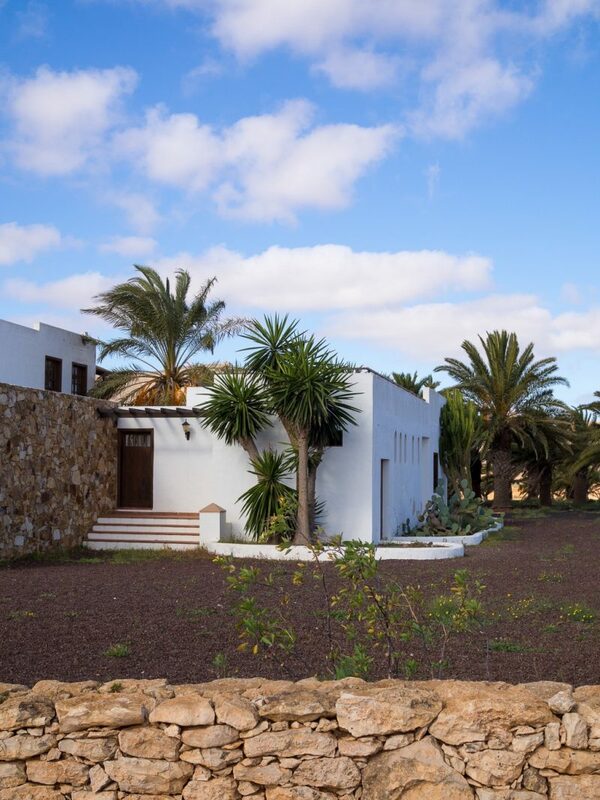 It has a beautiful terrace to chill out on or do your sunrise yoga, and there are two big kitchens so there’s plenty of room to cook and eat your own meals. You can either book a bed in a 2 or 4 bed dorm, or get a private room. The staff is super friendly and it’s not at all your typical party hostel. People from all ages are staying here, and everybody is there to either surf, windsurf, kitesurf, or stand up paddle. One thing I learned during my brief preparation for this last minute trip was that there are supposedly more goats than people on Fuerteventura. And goats means goat cheese. And who loves goat cheese? 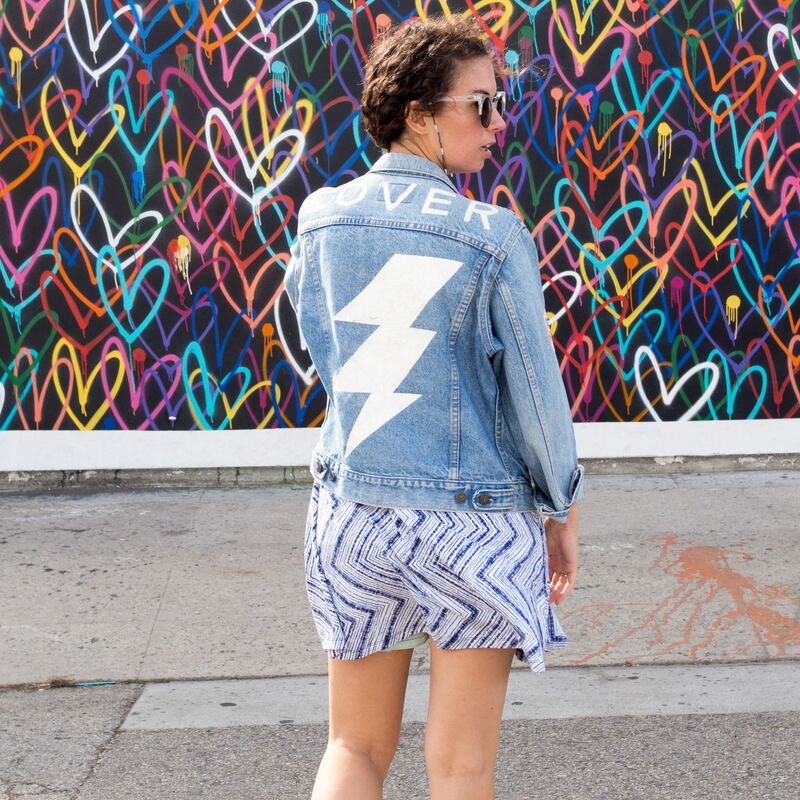 This girl. They make a special kind of goat cheese on the island, called Majorero. And they are so proud of their goat cheese that there is even a museum dedicated to these little rounds of deliciousness. 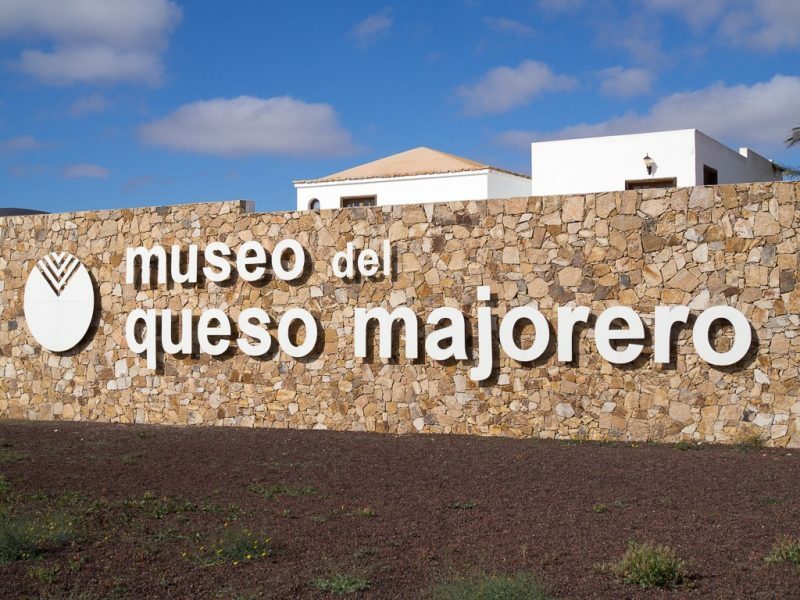 Hello, a museum for goat cheese! I love it. And also, there’s an actual goat cheese “statue” in Antigua. So awesome. 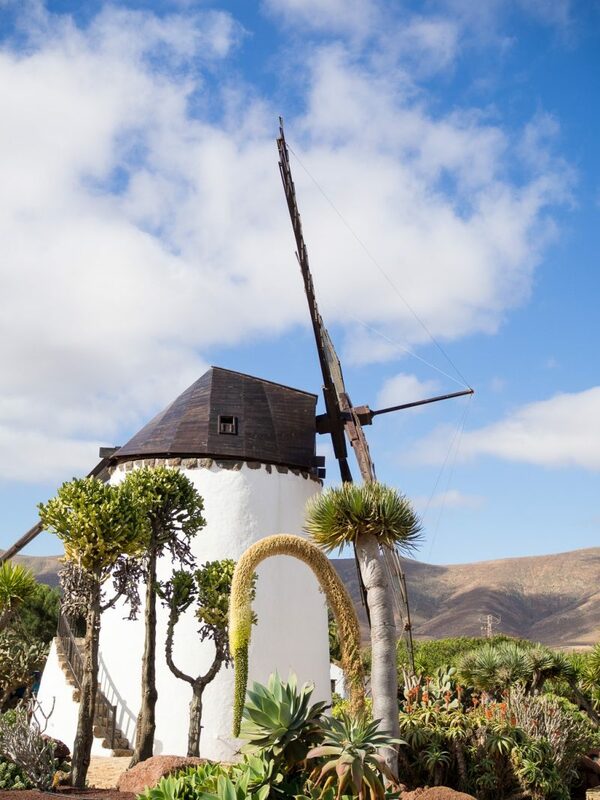 Another common sight when driving around Fuerteventura, you know besides goats roaming around everywhere, are the white, round windmills. 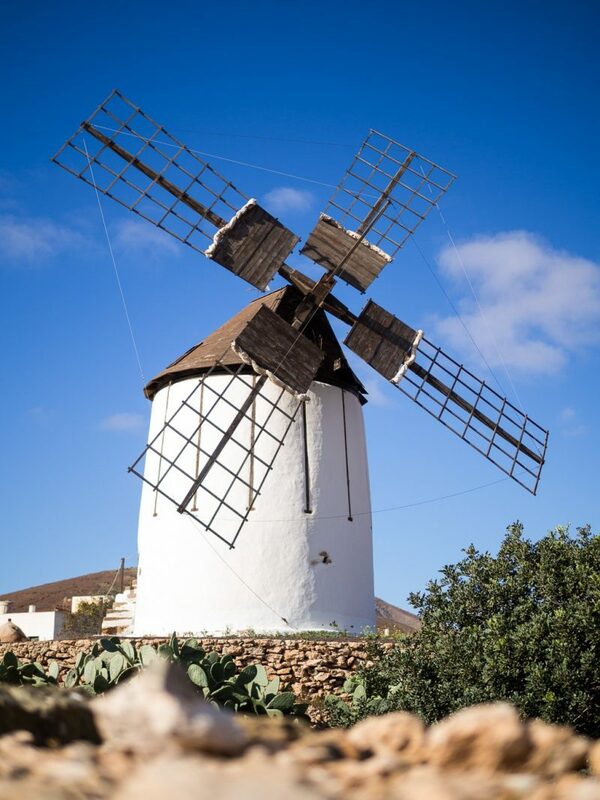 Topped with their wooden roofs, these molinos are as Don Quixote as they come. I even saw a few of them for sale, so you might want to look into that if you feel like embodying your inner DQ. I decided to make the most of my stay on this beautiful island, so I rented a car and drove around as much as possible each day after my surf session. The roads are very good (even better than mainland Spain) and it’s simply so cool to realize you’re driving between volcanoes. On my first day I made the mistake to refer to them as “mountains”. I immediately got the stink eye and was told that they aren’t mountains, they are volcanoes. Okay, noted. My favorite drive was the little road trip I took to Mirador Morro Velosa, a beautiful viewpoint in the middle of the island. The road gets very narrow on your way up, and at some point I wondered if this was really a two way road, and prayed that nobody was coming down. In the days that followed I learned that there are a lot of those crazy narrow and winding roads on Fuerteventura, and you just get used to it and back up a lot. Let’s just say, my driving skills improved big time in these few days. The viewpoint was absolutely worth it though. 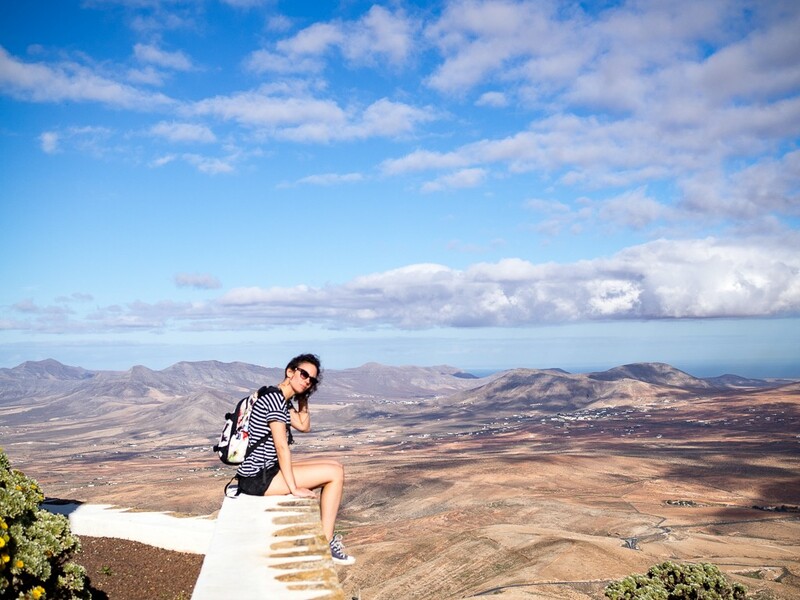 You can see all the way down to the coast at El Cotillo, and the view over all those volcanoes is breathtaking. Since I was going solo, I played around a bit with my camera to get some nice – and obviously súper casual – photos of myself in this gorgeous scenery. Yes, I’m such a nerd. Not far from the viewpoint you’ll find two big statues of half naked man. More respectfully, these are the statues of Guise and Ayose. 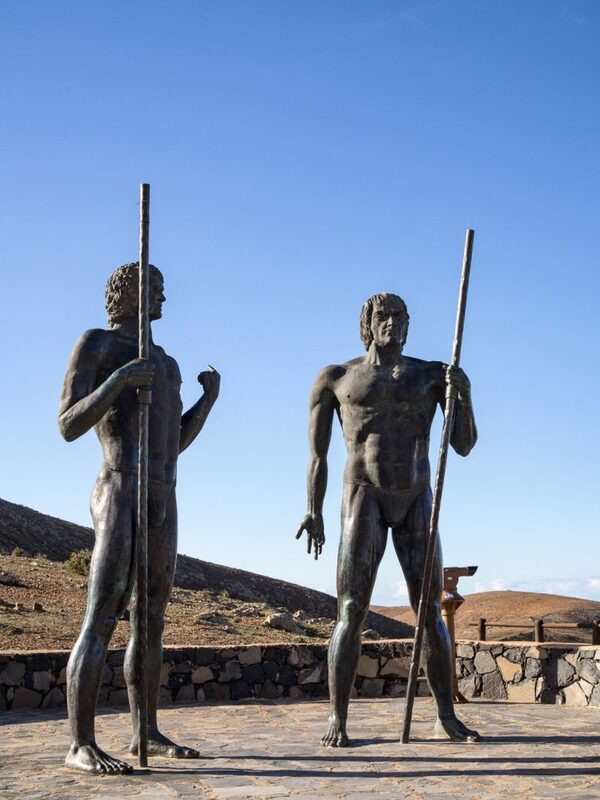 The two kings that, according to legend, once ruled over Fuerteventura. 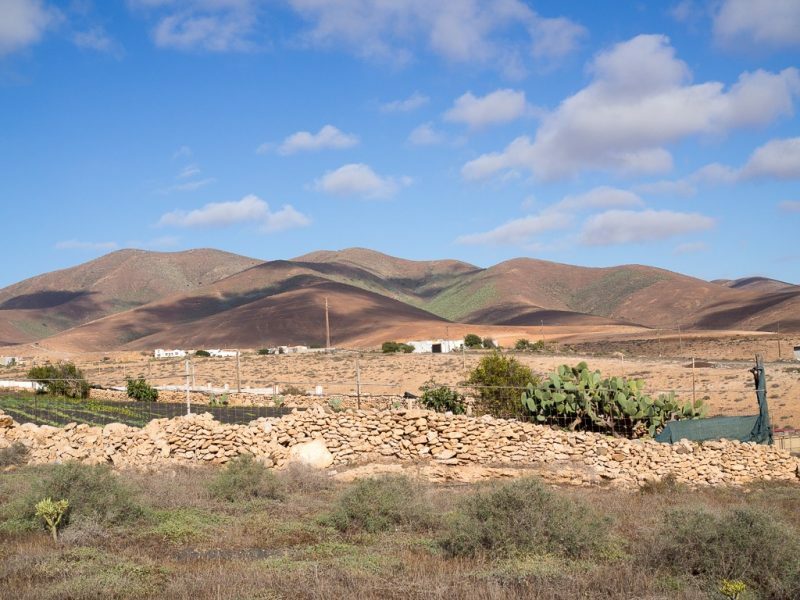 It’s close to the little town of Betancuria, which is well worth a visit since it seems like it has been frozen in time. Especially if you wait till the church bells start to ring. I wouldn’t have been surprised if some knights on horses would have made their appearance to stop someone from being decapitated or something. Just saying. Not far from Corralejo you’ll find some very big sand dunes, not uncommon to our coast here in The Netherlands. These sand dunes were formed by sand from the sahara that has been transported here by the strong winds always blowing here. 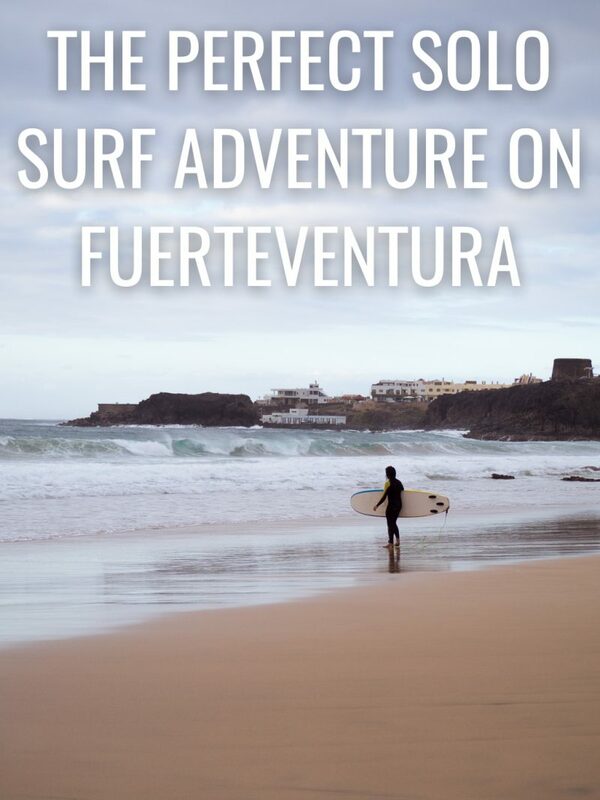 Ah, important fun fact: Fuerteventura means strong (fuerte) wind (ventura). Very accurate name if you ask me. Anyway, you can walk around and chill in these soft yellow sand dunes. But I can highly recommend coming out here at night. 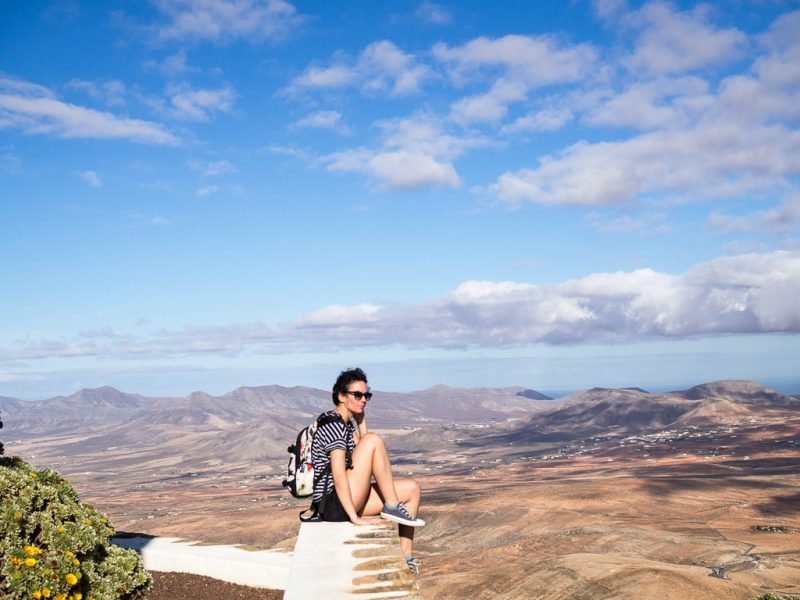 Fuerteventura is known as the best place to observe the stars in Europe, and it’s actually a “Starlight Preserve”. 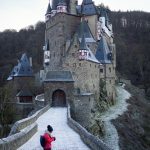 I went on a stargazing tour with Stars By Night, and it was absolutely amazing. I have honestly never seen this many stars. The tour was very informative and I learned all about different constellations, planets and stars. Among others, I got to see the constellation of Orion, Cassiopeia, and Pegasus. And my favorite part was seeing Venus and Mars. Our guide Inaki, told us how the night sky changes with the seasons, how the tides are affected by the moon, and where shooting stars come from. 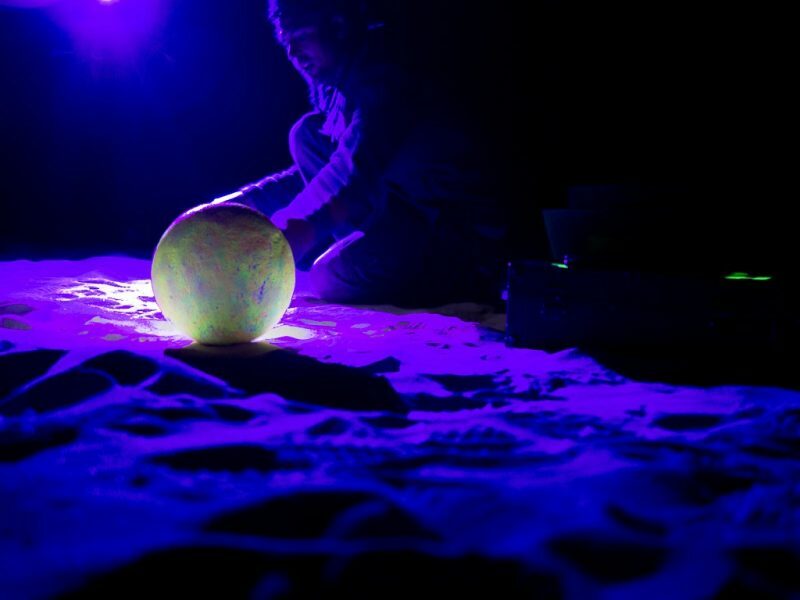 He even makes his own props, and paints them with glow in the dark paint so we could see them in the dark. Awesome. All the while I was laying on a blanket in the middle of the sand dunes, looking up to a sky bursting with stars. It was magical. On my final day I decided that after my surf it was time for some actual relaxing after all those hours on a yoga mat and surfboard. 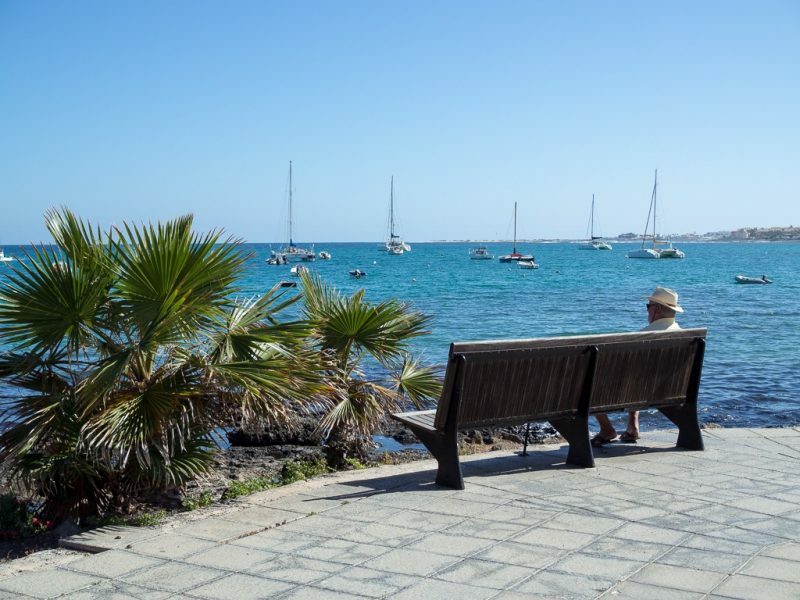 So I drove to the little harbor of Corralejo to catch a boat to the small uninhabited Isla de Lobos, just off the coast of Fuerteventura. As it was 1:15PM, the public ferry office had already closed (it’s still Spain after all). I roamed around the lovely little harbor for a while, which is a perfect place to grab some lunch with a view. But I wanted to get to Lobos, so I just walked up to one of the booths offering transfers and tours and asked when the next boat was going. A friendly older gentleman named Jesus, the owner of Fuertecharter, told me that somebody could take me at 2PM. 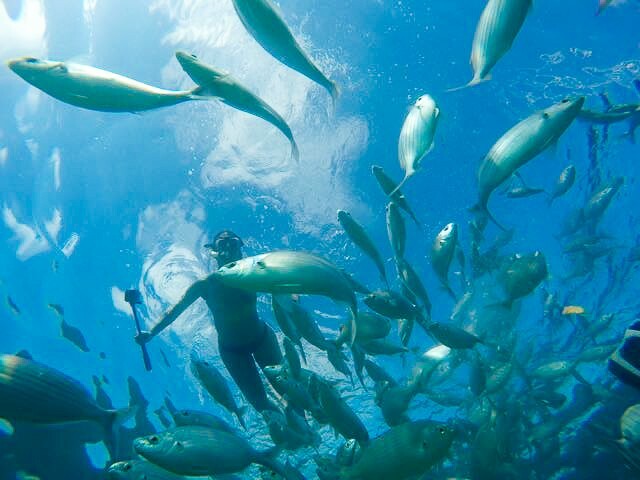 And as I was mentally preparing myself for a boat trip (I get seasick very – VERY – easily) they asked me if I wanted to go on their catamaran instead, and sail around the islands for a few hours. All drinks and activities included, and they offered me a discount since it was so last minute (and so nobody had to take me on a separate boat). YESSSSS. So for the rest of the afternoon I chilled on the catamaran, walked around Isla de Lobos, snorkeled with funky fishes, did some stand up paddling, and had some nice conversations while sipping on champagne. Oh yes people, the struggle was real. It was the perfect end to a perfect solo adventure. Going solo for a few days was exactly what I needed, and I’m so happy that I decided to go. 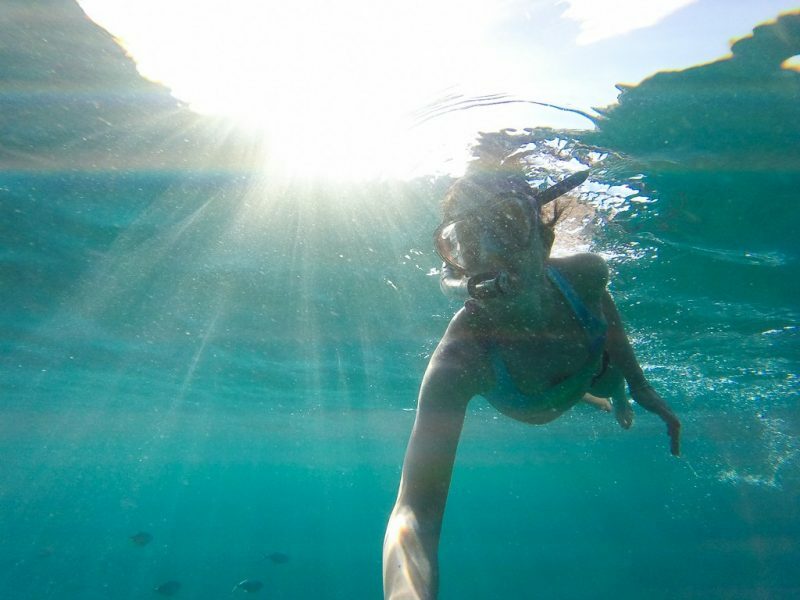 And even though I could have easily stayed longer, catching waves, exploring the island, and focusing on my health, I was happy to go home to my handsome husband. Like I said. I love our team. 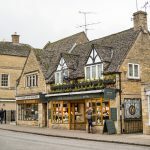 Next week we’re going on a weekend getaway to the Cotswolds to hike in the beautiful English countryside and to celebrate the husband’s birthday. Follow @littlelarey on Instagram to see more of my photos.